If I drink more than a six-pack of soft drinks in a year, that's a lot. Odd considering that I grew up mixing all kinds of sodas in my family's fountain service store in East New York. But when my friend Dante shipped me a really swell beverage carbonator a few weeks back, for the purpose of trying my hand at carbonated cocktails, all I was able to think about was making some soda. And not just any soda. 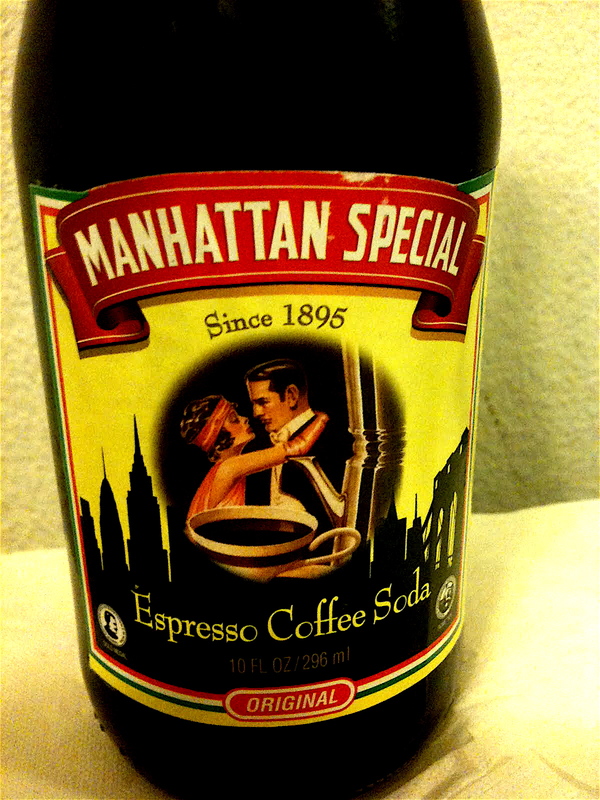 It had to be this one: Manhattan Special. Not exactly a household name, I know. But they've been making this stuff since 1895. The company that produces it is still family owned, and the manufacturing plant is where it has always been: Williamsburg, Brooklyn. Here's a story the Times did a while back. I used to drink a ton of Manhattan Special (we just called it "coffee soda") when I was a kid, but now only treat myself to a taste occasionally. So, here you've got the contraption. It's called Twist 'n Sparkle. It's a snap to use. All you do is insert a CO2 cartridge into this wand here, then drop the wand into the plastic bottle. 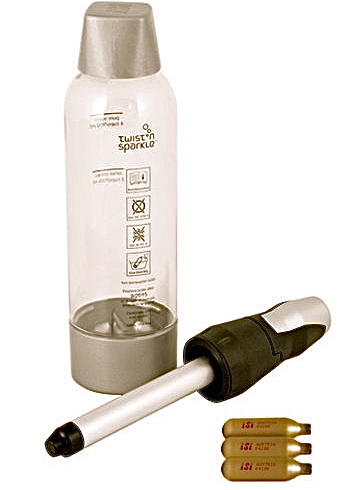 When you screw the wand into the bottle the gas is automatically released from the cartridge. To make my coffee soda I brewed about three and a half cups of espresso in a regular coffee maker and added 6 tablespoons of sugar. The sugar part was a little hard to cope with, as I never use it in my coffee. Oh, and the whole thing needed to be chilled before carbonating. I can't believe I'm saying this, but I wound up with a drink that really was very close to the original. I think that if I played around with the coffee-to-sugar ratio a bit more I might even get it precisely right. Or, I could just head on over to Williamsburg and get the real thing. You can blame my cousin John for this. The guy just had to go and tell me about the "pig's blood cookies" that our grandfather used to like so damned much. What we'll do here is just stick to the facts and move along. First of all, my cousin John's memory may not be entirely reliable. It's more likely that our grandfather enjoyed not a "blood cookie" but a blood pudding served with cookies. That's the way our Aunt Anna remembers it. And much as I respect my cousin, he would have been just a child at the time. Tradition also supports my aunt's theory. A dessert known as sanguinaccio dolce (basically a blood pudding that's made to be sweet) goes back generations in Italian culture. And it is often served with some type of crisp cookie. My version of sanguinaccio dolce is anything but traditional, in method or spirit. In my grandfather's day the blood used to make the pudding would have come from freshly slaughtered pigs, because it was considered wrong to waste any part of an animal killed for food. I got my pig's blood out of the freezer case at a local Asian market; it came from New Jersey. My motives weren't so honorable either: An unusual-sounding food became known to me (thanks to my rotten cousin) and so I simply had to try it. I also learned that this pudding often is associated with Carnevale. And so today being the final day of the annual celebration ("Fat Tuesday" as it's know in the U.S.) I decided to make a batch of sanguinaccio dolce and get this whole matter behind me once and for all. I searched far and wide for a recipe but wound up winging it a little, just so that I could make as small a batch as I could. I don't expect a single one of you to try making this. I doubt that I will again. Not because it doesn't taste good. It does. In fact, the taste is very rich, maybe even a bit too rich. It's just that even the modern Italians have largely moved away from this ancient preparation, and I can't see a good reason why I would want to hold fast to it. I'm not so sure my grandfather would have either. Run the blood through a sieve and then add it to the milk in a double boiler over medium heat. Stir in the spices and sugar. Add the nuts and the chocolate and stir. When the pudding is the consistency of heavy cream remove it from the stovetop, pour into a bowl and refrigerate until cold. Serve in bowls with crisp cookies of your choice. My friend Tom has spent much of his professional life learning and writing about food. Several times a week he attends elaborate dinners at some of the country's best restaurants and hotels. The food he is accustomed to sampling at these events is prepared by some very talented chefs. And so it might surprise you to learn that, in some matters culinary, my friend can be a real pinhead. He won't eat Asian food of any type because his mommy used to feed him crappy Chinese takeout when he was really really little. Nor will he eat seafood except under duress, also something he blames on his poor mother. But it is on the matter of panettone where my friend and I have often come close to blows. Tom's position has always been that he never met a box of the Italian sweet bread that he has liked. And that because of this one does not exist. "Why not just eat the cardboard box that it comes in?" he has said to me many times when we visit over the holidays. "It's just as dry and doesn't have the calories." Except that this past holiday season Tom showed up at my doorstep one afternoon with a grin on his ugly kisser and a half-eaten panettone tumbling out from his backpack. "I don't know why you say this stuff is so dry," he teased while releasing the fragrant bread from its plastic wrap. "This is delicious. And moist! "Hell, Meatball, I might even bake it for you one of these days." Turns out that he did. And he didn't. Yesterday I received not a box of bread from Tom but an email with photographs. Of the panettone that he had made for... Who the hell cares, it wasn't for me. I had to settle for the instructions on how to make one of my favorite breads. And so will you. Just one thing about the recipe, in case you ever think about trying it yourself. Tom used the King Arthur Flour Panettone Recipe but fiddled with it some. He tells me he'd feel a lot better if people went with the King's recipe, and I'd have to admit that I would too. This is the biga, a starter of flour, water and a small amount of yeast, which fermented for about 14 hours. The biga is added to a mixture containing flour, eggs, butter, flavorings, yeast, sugar and grated nutmeg. This gets kneaded in a machine with a dough hook for five minutes and then finished by hand for another two minutes. The dough should be silky, not sticky. After the dough rests for an hour, flatten into a rectangle and add golden raisins and candied orange peel. Knead the fruit into the dough. Tom doesn't have a panettone pan, so he used the pot that he uses for his morning oatmeal. The pan was buttered and lined with parchment so that it could rise above the pan's height. The dough doubled in size. Here's the finished loaf after peeling away the parchment. Looks just like it came out of a fancy box from Milano, no? The crust, says my friend, was crisp and buttery, the crumb dense but well textured. The flavor? Spot on. Unique in the way that only panettone can be. Not bad for a pinhead, I guess. I never met Dominic Coluccio, but I know that I would have liked him. A lot. 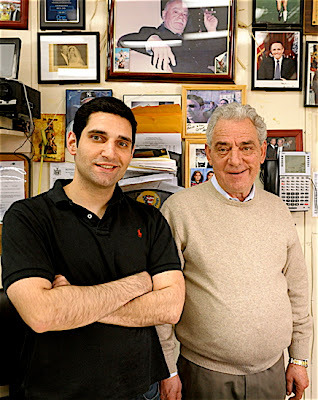 The business he founded more than half a century ago is among my favorite specialty food shops on the planet: D. Coluccio & Sons, on 60th St. at 12th Ave., in Brooklyn, New York. It's where I buy many of my most crucial staples: Italian cheeses and pasta flours and tomatoes and olives and figs and chickpea flour and salted fish and dried beans and anchovies and polenta and candies and a lot of other things. Virtually all of it comes from Italy. Coluccio's isn't just a food store; in fact, it's largely an importer and a wholesaler. This is no "New Brooklyn" yuppie hangout, friends. It's the real deal. Old school. English is a second language here. I'm not kidding. Listen to the shoppers walking the aisles and waiting at the cheese counter; many, if not most, parlano Italiano. The only thing that I don't get is how far under the radar it flies. I know lifelong New Yorkers who had never heard of Coluccio's until I mentioned it to them. Some even live in Brooklyn. Recently one of my crew had to inform the chef/owner of a very fine (and known) Manhattan restaurant of Coluccio's existence; in a matter of days the chef was an enthusiastic and loyal customer. Shop there. Don't shop there. Makes no difference to me. Just don't ever say that I didn't try and steer you right. Because I just did. This is only a portion of the pasta aisle. If you are looking for a particular type or shape of dried pasta and it isn't here, then maybe it only exists in your imagination. It's rare that I have to buy flours anyplace else. When I make fresh pasta I use a combination of flours, one of them a very fine semolina that I can only find here. The chickpea flour for making farinata? It's right here. So are a few different types of polenta that I like. Italian chestnuts, along with any other fresh nut you may desire. Dried beans and lentils. The store has about every type you could ever need. "The Captain" (aka, my favorite cheesemonger) dives into a can of salted fish. Speaking of which, this is how the front of the store looked around the holidays. Good luck finding a place that stocks more varieties of dry salted fish. Rarely do I get out of the store without a pound or two of these peppers. I'd have to say that the cheeses might be the store's biggest draw for me. These are just some of the many hard Italian cheeses Coluccio's carries, and there are plenty of others as well. Want to taste a real burrata — from Italy? That's a very difficult find in the U.S., but you can get it here sometimes. The Parmigiano-Reggiano at Coluccio's is excellent and very well priced (trust me, I go through a ton of it). And if you have never had a real Romano cheese (like, from Rome, where not much is produced) then you must try a chunk of the Genuino Romano. It's another thing you can't find very often, but you can always get it here. You don't go to Coluccio's to get sliced meats, you go for whole salami and hunks of prosciutto or pancetta, like that. Hey, what can I tell you? They don't do slices. This Nutella is different than the kind you see around the country. Because it's in a real glass jar and because it's made in Italy. Coluccio's imports every size jar, even the 11-pound (plastic) monster on the right. Bakers take note: There's a ridiculous variety of flavorings in stock. I tried to count them all but The Captain had a very important question about my cheese order and so I had to run. Frozen sfogliatelle and cannoli cream from Cannoli Plus. I hate to break this to you but a lot of pastry shops buy their stuff this way instead of making it themselves. And so consider this an enthusiastic recommendation to stop by the store should you be in the area. If you happen to run into Louis Coluccio or his father Luigi, tell them the Meatball sent you. And that I'll be by to see them again real soon. These are my parents. It is their wedding day. Mom wore a blue dress, dad a grey sport jacket. Nothing fancy. You can see by the classic Neopolitan (flip and drip) espresso pot that their celebration is nearing its completion. It is how a lot of our family gatherings end, even today. You may not think anything mysterious or unusual here. However, listen to the language and then decide. "Do you want brown coffee," members of my family will ask at meal's end, "or demitasse?" This is when first-time guests begin to scour the room, searching for a kindly face who might provide them with a freaking clue. Literally, you are being asked to choose between a hot American coffee and an empty "half cup," or demitasse. It's a French word. Why my Italian-American family used it so determinedly I cannot say. Practically, of course, my people would never be so rude as to offer a person, well, nothing. What they are really asking is whether you would like a regular coffee or an espresso that is served in a demitasse. As time has passed the language has changed somewhat. Rarely is the French term employed, but neither is the proper espresso. "Brown coffee or black?" became quite commonly used, or the even simpler "Brown or black?" Once it became evident that brown attracted more takers, a simple "Black?" whispered to those who exhibited such tendencies sufficed. I align myself strongly with the whispered-to crowd. Even my house "brown," sourced from the same small coffee roaster in Brooklyn for many years, is, at my direction, 80 percent espresso beans. Which, as you might imagine, can make the brown versus black coffee debate a murky topic around my house. And don't even get me started again on the whole demitasse thing.